We pride ourselves on the ability to provide you with expert welding knowledge so you can focus on meeting your business goals. 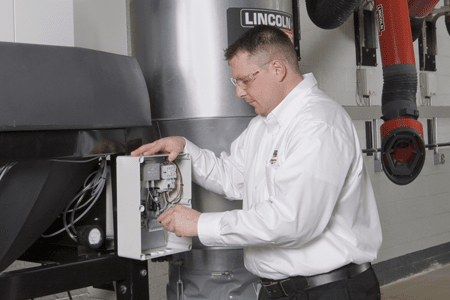 Lincoln Electric’s solutions approach will provide you with everything you need in a complete system – welding, fixturing, tooling, cutting and environmental systems. We build solutions and systems around your parts. We start with the arc, moving backwards and outwards from there to develop improvements from material handling to final part delivery. With manufacturing operations, joint ventures and alliances in 20 plus countries, we have the ability to provide complete and reliable solutions and services you need – from anywhere. With 1000s of robot installations of all manufacturers, we know what it takes to keep your operation welding efficiently, with high productivity and lower production costs. We provide the solutions, you need with the results you want. Orbital MIG & TIG welding systems , intended for tube and pipe joining, incorporate all necessary components including clamp-one weld heads, operator pendants, controllers, welding power sources, water coolers and track rings if necessary. Together, these components deliver the precise arc control and monitoring capability required by code-regulated power generation applications in power plants, chemical plants or refineries. Lincoln Electric offers a wide spectrum of robotic welding systems. Our welding automation experts will work with your team to analyze your manufacturing process and recommend system options. For fixed, turntable and positioning systems, we can modify or completely customize to meet virtually any fabrication need. Our fixed table systems are suited for applications that do not require part-rotation or repositioning. These systems take minimal installation, because they’re shipped completely assembled. Lincoln Electric’s fixed table robotic welding systems include the following: Auto-Mate® pre-engineered robotic cells are ideal for small manufacturers or job shops that don’t plan on staying small forever. These affordable cells enable you to implement automated welding quickly and easily. It’s an entry point for the first-time buyer. Both of these new pre-engineered robotic welding systems – Auto-Mate 5 and Auto-Mate 10 – are set up for MIG and flux-cored welding processes performed by a FANUC® ArcMate® 0iB robot driven by a Power Wave® R350 power source. System 20 cells are for small to medium sized parts. It’s two-sided and has an option to expand to a three to four-sided system. System 40 cells are for small to medium sized parts. They have a servo-driven positioner that is nearly maintenance-free with no mechanical components to fail. 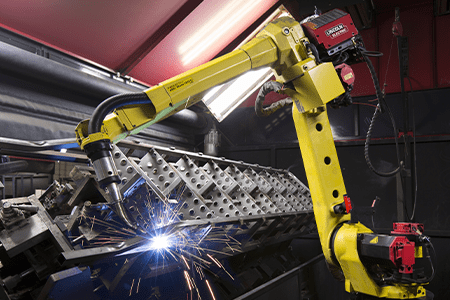 Custom robotic systems can be fully automated for virtually any welding process or application – ranging from MIG, TIG or spot welding – to vision-based systems for material handling, machine tending, palletizing, dispensing and more. Whether your plan is to use new or re-deployed robots, or any combination, Lincoln Electric can integrate the design and bring your project to a safe, efficient and affordable conclusion. Call to discuss a solution today! 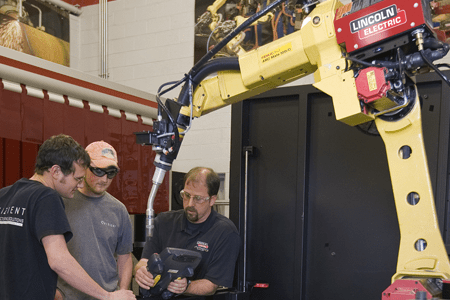 Lincoln Electric is a supplier of advanced robotic systems that can be fully automated for virtually any welding process or application – ranging from MIG, TIG or spot welding – to vision-based systems for material handling, machine tending, palletizing, dispensing and more. Whether your plan is to use new or re-deployed robots, or any combination, Lincoln Electric can integrate the design and bring your project to a safe, efficient and affordable conclusion. Laser welding can help you make narrow and deep welds at high welding speeds and is often used in welding for high volume applications or in applications where low heat is important. In some cases, you may be able to make a weld that was not possible because of limitations with metal inert gas (MIG) process and tungsten inert gas (TIG) process. If you need high speed and a controlled heat input for meticulous detail, then a laser welding solution is for you. However, keep in mind that in some applications it may be more economical to use another automated welding process. Always consult Lincoln Electric before making a purchase. The Flex Lase® system for laser processing is an extremely flexible tool that can address a variety of needs – from laser welding, cutting, brazing and cladding to laser heat treating, marketing, etching or paint and coating removal. Laser hot wire cladding provides high volume deposition rates and low dilution with high travel speed and minimal heat input for precise detail. Rather than joining two pieces of material, the process deposits weld metal on the surface of the work. It bonds a molten pool created by using a solid-state laser to melt a preheated wire and is ideal for depositing corrosion and wear resistant materials. Because this is a metallurgical bond with low heat input/distortion, it is also great for repairing worn or damaged parts with minimal distortion. The power supply uses a process to control the heat of the filler wire prior to its introduction into the weld puddle. By suppressing an arc, the process maximizes the heat in the wire and the deposition rate, allowing for higher travel speeds and thinner clad layers. With less heat, there is less damage dimensionally to the material around the area being clad. Hybrid laser arc welding (HLAW) is an automated, high-performance welding process, which results in a very narrow heat-affected zone (HAZ) with deep penetration and high travel speeds relative to traditional processes. This breakthrough approach combines the highly focused intensity of a laser with the joint filling capability of the traditional MIG process. By combining the two, HLAW provides a unique opportunity for thicker welds with less filler metal and higher travel speeds than typical welding. Because the HLAW process adds filler material, it can address fit-up and chemistry issues for some joints, which are a concern for laser welding without any filler. We can provide two important value-added capabilities to any complex automation project. First, we can provide extensive 3D modeling, using CAD translation from customer supplied part geometry data. Finite Element Analysis is also used to optimize line engineering designs, identify and resolve time and resource issues and reduce lead times. The use of these programs allows our team and yours to visualize and evaluate automation and tooling early in an ‘off-line’ mode. Benefits include reduced de-bug analysis during the system build and validation of cycle time projections for complex systems. We also have a complete, modern machine shop and a dedicated tool building group, capable of producing precision-machined components and subassemblies to specifications. This capability eliminates the need to contract with third party machining houses to build line components, reducing opportunity for miscommunication as well as final system costs. The result is optimized system performance leading to high part yield and quality. Tubular fabricated components have become the ideal engineered solution for an ever increasing number of applications and markets – ranging from automotive and appliance, to HVAC, refrigeration, steel furniture and more. With this growth comes an inevitable demand for higher component part quality and productivity, including quick job change-over capability to meet production environment ‘just in time’ demands. Hydroforming is a cost-effective way to shape metal into strong and lightweight components. This specialized die forming uses high pressure hydraulic fluid to press working material into the die. The use of tubular hydroformed components in automotive applications worldwide is increasing with each new model launch. Frames, structural members and suspension components made using the hydroform process provide greater rigidity and strength compared to their traditionally welded counterparts. Component shapes can be optimized for form or function. Reinforcing components or additional bracket elements can often be eliminated, allowing for simplified assembly, better fit up and higher quality in the finished vehicle. Lincoln Electric offers one of the broadest cutting product portfolios in the metalworking industry. This portfolio includes plasma cutters ranging from 25 to 400 amps, Harris® oxyfuel cutting systems, Torchmate® CNC plasma cutting tables including torch height control systems, Vernon Tool® tube and pipe profilers and tube cutting machines, as well as the PythonX® all-in-one structural steel fabricating system capable of replacing drilling, punching, sawing and hand torching operations. For exceptional cut edge quality and consistency, the Burny® shape cutting controllers paired with the Spirit® II plasma power sources which features FineLine™ high definition plasma cutting technology produces square and virtually dross free cuts. When bolt quality holes are needed, FineLine is paired with our UltraSharp™ hole technology to provide industry leading 1:1 hole quality that requires virtually no secondary processing. Call a Technical Service Representative today to get more information on any Automation Solution. We have a global team of professionally trained Technical Sales Representatives, Application Engineers, and Customer Service Representatives ready to help you improve quality and productivity, while reducing costs. 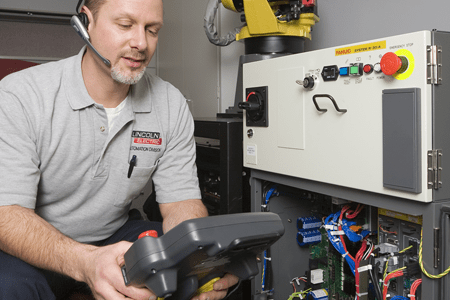 Our team of certified technicians and engineers are focused on supporting you in every aspect of your automation equipment service and support needs. Our team is fully equipped with professional factory certified technicians ready to assist you in a variety of needs. Complete this form to have a Lincoln Electric representative contact you to discuss Automation Solutions.